Margaret Young, Sandy Farkus, Stephen Farkus, Arthur Young. About 1949, Hazleton Heights, PA.
Photo by Joseph E. Genetti. This has been an amazing month! So many cousin connections made during April and May, that my heart is overflowing with joy! The branches of the Genetti family tree extend in many directions, resulting in thousands of descendants – therefore, thousands of cousins! Today’s blog post is dedicated to all of my newly found cousins. Most emails I receive are from 3rd or 4th cousins, and sometimes, even more distant family members. But this past month I was thrilled to have several first cousins locate me through our website. Sandra Farkus Eshelman is my first cousin through my Aunt Catherine Genetti Farkus. Sandy sent a message to me via the Genetti website. I cried tears of happiness when I saw that email. As one of my first babysitters, I have fond memories of Sandy from my childhood, but we had been out of touch for over 50 years! Since she reached out to me a month ago, we have been sharing photos, memories and are now connected on Facebook. Rita Genetti Young (1915-1998), Leon Genetti Jr. (living), Catherine Genetti Farkus (1917-2001) – siblings. Photographed at the 50th Wedding Anniversary of Catherine and Stephen Farkus – 1992, Reading, PA.
Photo by Sandra Farkus Eshelman. It only took a few days for another first cousin, Margaret Young Lychock, to find me through Sandy’s friend list on Facebook. Margaret (and her twin brother Arthur) are my first cousins through their mother Rita Genetti Young, (my father’s sister). Margaret and I spent an hour on the phone catching up. I was over-the-moon happy that we once again had a cousin connection. Plus Margaret’s daughter, Lisa Ann (who is only a few years younger than me) is now also part of my cousin circle. Lisa Ann is my first cousin, once removed. We all share the common ancestors of Leon Genetti and Angeline Marchetti (the grandparents of Margaret, Arthur, Sandy and I; the great-grandparents of Lisa Ann). 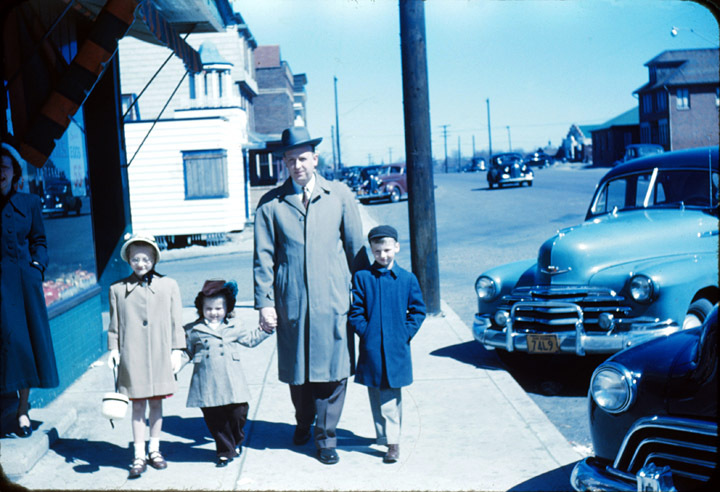 The vintage photo pictured above is of three cousins (Margaret, Sandy and Arthur) walking with Sandy’s father, Stephen Farkus on Easter morning (probably 1949) in front of one of the first Genetti markets. Originally managed by my grandfather Leon Genetti, the market was later run by Steve Kashi (Leon’s son-in-law who was married to his daughter Adeline Genetti). The store was a small, neighborhood grocery attached to my grandparents’ home, located in Hazleton Heights, across the street from St. Gabriel’s Cemetery. I remember visiting the store as a small child. Instead of candy, my Uncle Kashi always gave me a tube of toothpaste from the grocery shelf. What funny things stick in our memories! Check out the wonderful old cars parked at the curb in this photo! Hello to Chandra Genetti Chitswara, the granddaughter of Leon Genetti, Junior. Chandra’s great-grandparents were also my grandparents. That makes us first cousins, once removed. Chandra wrote to inquire about a Descendants Report. This is a statistical data file generated through my Family Tree Maker software. The Report details five generations of descendants (names, stats, etc.). I ran the report for her using Cosma Damiano Genetti as the starting point, Chandra’s 2nd great-grandfather and my great-grandfather. Imagine our surprise when the software spit out a 24-page PDF of our shared family descendants! A shout out to Robert Genetti, Ken Genetti, Cathy Genetti Reinhard, Jim Genetti and Marilee Genetti Yerkovich. All are descendants of the Wyoming Genetti branch of our tree. All wrote me recently – and all are closely related to each other, having the common ancestors of Angelo Genetti and Teresa Annunziata Marchetti. The Wyoming Genetti Family is also related twice to the Pennsylvania Genetti Family – through two separate branches of the tree! And they are related twice to a branch of the Genetti family who settled in Michigan – distantly through the Genetti tree and a second time much closer through the Marchetti family. Matter-of-fact, the four Wyoming brothers (see previous blog post) were first cousins, (related through their Marchetti mothers who were sisters), to Pietro Genetti who settled in Ironwood, Michigan. Make sure you attend the Genetti Reunion in October, when I explain more about cousin inter-relations between branches of our tree. I guarantee you’ll find it fascinating! Hello to Carol Genetti of Colorado! 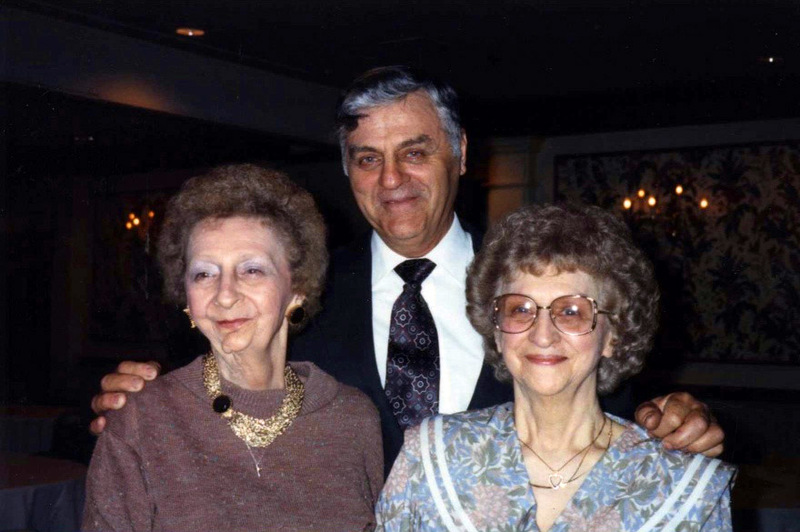 Carol’s grandfather, Enrico Genetti, also immigrated to Ironwood, Michigan. He was a third cousin to Pietro Genetti, mentioned in the paragraph above. Carol’s branch is noted on the original Genetti family tree, however a bit more research is required on my part before I can enter her ancestors into our current online tree. Hopefully I will get to this soon! 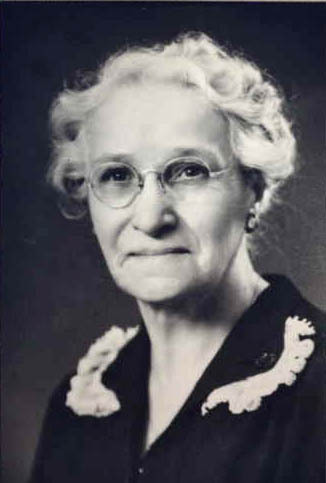 And finally, hugs go out to Linda Pettis Sullivan, a descendant of Erminia Genetti (1876-1972) and Emmanuel Recla (1866-1939), who are Linda’s great-grandparents. Last month I was browsing through my DNA matches on Ancestry.com. I notice that Ancestry’s software had matched Linda and I through our shared 2nd great-grandparents, Leone and Cattarina Genetti. We were 3rd cousins! I sent off a message ASAP, introducing myself and sharing the web address for The Genetti Family Genealogy Project. Linda wrote back immediately, confirming that yes we were cousins and that I had already contacted her sister Mary Pettis Russell (whose DNA I had also matched earlier on Ancestry.com). What a small, small world we live in! Thank you to all Genetti cousins for enriching our shared ancestry experience! I hope to meet many of you at the family reunion in October. ← Sale on Family Tree Prints!